The Expat Savings Team is a financial advice company who assist the expat market. It focuses exclusively on getting all expats a better rate of interest on their savings. We worked in Expat lead generation for some years and the Expat Savings Team came to us based on this reputation. 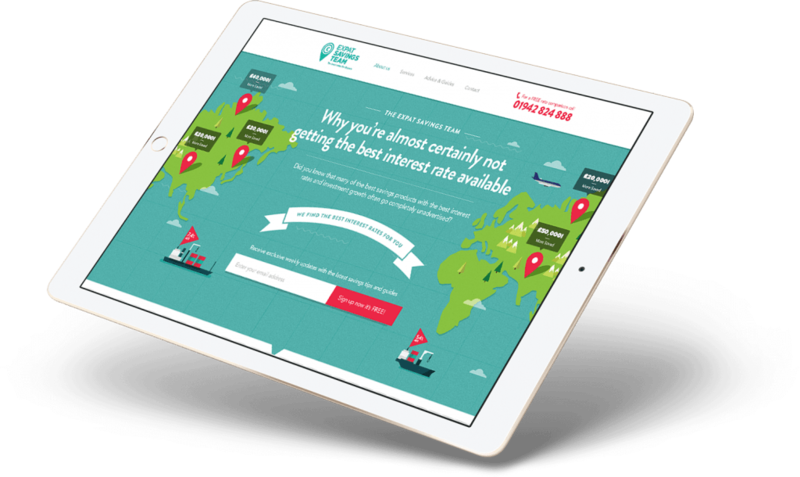 Expat Savings Team were looking for a design which simplified the often daunting world of interest rates. They required a design which connected with the expat community - it needed to be accommodating, understanding, and informative. Charged with creating a bespoke and vibrant travel and leisure website design for a newly established service, we considered many designs before deciding upon an animated layout. Through this we planned to showcase a personable charm matched with attention-grabbing appeal. Numerous factors were important to the new design, most prominently its ability to cater for expats from differing nations, its precision in relaying accurate information, and the promotion of an accessible user interface. Illustrations would play a key part in the realisation of these goals, making for an approachable brand image based on trustworthy ideals. A striking colour scheme was developed as part of the new website through our branding and creative skills. With a focus on bold simplicity to express the key attributes of the company, the end result is a memorable design which complements the lively illustrations. The striking design is a call to action colour scheme which draws users towards Expat Savings Team’s key services. These are integral to the visual appeal of the site as they promote an international appreciation whilst maintaining a friendly tone. Our team had a great time developing them, coding several on the homepage to surge across the screen as part of the call to action colour scheme. Along with the playful illustrations of international mobility, the world map was represented in an offbeat manner. Custom icons were designed around this to keep in line with the colour scheme and logo, culminating in a highly expressive homepage which is the forefront of the brand’s business approach. A striking colour scheme was developed as part of the new website, with a focus on bold simplicity to express the key attributes of the company. The end result is a memorable design which complements the lively illustrations, ultimately creating a call to action colour scheme which draws users towards Expat Savings Team’s key services.